Right from helping you optimize your content, be it text, images or even videos such that it is conveniently visible on various devices and across all browsers, we do it all. To begin with, you must first understand that though Responsive Web Design for just a fad in the recent past, today it is more of a necessity. Since digital content isn’t just being viewed on laptops and desktop but has penetrated the world of handled devices such as mobile phones and tablets, websites need to be designed in a way that they can be conveniently viewed on any platform as and when needed. Right from a 15.6 laptop screen’s landscape mode, to a 4.5-inch portrait mode screen f a smartphone, the user must have a seamless experience. So, how exactly do you go about doing so? Well, the answer is simple! All you need someone as trustworthy as our dedicated team, here at MATEBIZ – the Responsive Website Designing Company of your dreams! We help create web pages that can be conveniently navigated on any device or any size! And while doing so, we ensure that users enjoy clear readability, complete with seamless navigation! In fact, we make sure that the need for horizontal scrolling is completely eliminated. In addition, the websites we design comprise of easily visible and extremely simple call to action! For what it’s worth, fluidity is the censure of our responsive website designing efforts! 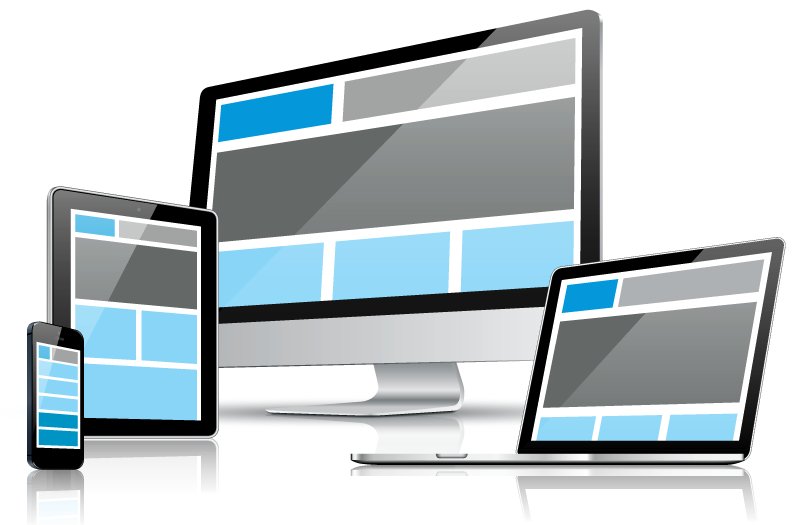 A responsive website design makes website fit the screens of tablet, ipads, mobile phones and your regular laptop and desktop screens. Responsive Website Designing is something that needs a lateral way of thinking, which is something that our team of experts is incredibly good at! In addition, we aim to offer the best of Responsive Website Designing services while adhering to your budget constraints, which give us a competitive edge over other players in the market! And as far as our proficiency is concerned, we bet that you won’t find any responsive Website Designing Company in India that beats us! When you in a nation which is among the top nations of mobile phone user then you should go to Responsive website designing in India. And Matebiz is here for to give you the best web solutions for your website Matebiz is one of the most emerging companies that provide the service responsive website designing in India so just contact us for your website designing and enjoy our services. The greatest and main target for any website today is to impress Search engines because Google is the master of online searching. Admit it or not, Google loves and favors the responsive website designs. It will put the websites with responsive web design on top of its search good results. It is because mobile devices have become typical in the world and big percent of all company done online is done through these mobile devices. Google knows when a website is mobile enhanced and it matters it as a plus. Jump rate is one thing that is best handled with a sensitive website design. Almost all the people who have used mobile phones and mobile phones once to search a website at some point know what makes them jump off a website. The tiny print, hard to comprehend images and a lot of scrolling are the biggest reasons why visitors don’t stay on a website for long. Responsive web design lets the website adjust according to the screen size and makes it easy for the user to use the website with minimal scrolling and having to deal with tiny images and text. Google has been looking more serious about user experience in the past couple of years. One of the most important aspects that directly impact user experience is the page loading speed and time of the website. The absence of redirecting to a mobile website when you have a mobile enhanced website reduces the website loading time to a great extent. This results in better user encounter and thus a happy Google. Some people might think that having a mobile web page and a individual website for desktop computers is a better option when there is a lot of content on the website. However, they overlook the big fact that a separate mobile web page needs to be built and enhanced from scratch. All your back links and social media indicators will be introduced down to zero. You will have to make a reputation and identification for this website from scratch. A sensitive web design removes this challenge from your path. All the website designing experts and experts agree to the fact that a responsive website design is the present and future of web designing. To be in competitors and beat your opponents, it’s best that you go for a mobile optimized website today.